Everything seems to be electronic these days, so why not make books electronic, too? 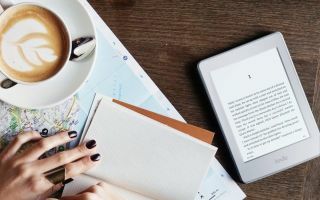 Nothing beats the smell of a book fresh off the printing press, but there are lots of reasons why investing in a Kindle or e-reader is a great forward step. Firstly, the library you have access too is huge; there’s more titles than a bookshop could ever throw at you, and the e-version of the book is usually cheaper to buy, too- great if you tend to whizz through a book in a couple of days. Every holiday, you may feel obliged to buy a book to keep you entertained by the poolside. More often than not the pages get wet, the sun melts the binding glue and you end up hopelessly trying to hold the book together as you battle your way through the pages. Kindles and e-readers are durable pieces of tech - and while they may not survive a complete submergence or hours in direct light, they’re certainly a match to the tribulations of poolside reading and if the book you bought happens to endorse similar feelings to when you were forced to read Keats at school, you can always check into the library and download another - easy peazy . So what Kindle or e-reader should you buy? An Amazon Kindle is always a safe option but there’s various versions available. Some displays are smaller than others. Some offer up more storage space. Some connect to the library via wifi, while others allow you to do it via 3G. If you’re looking to read a book interspersed with checking your social media, a Kindle Fire Tablet may be just the ticket. Whilst Amazon dominate the e-reader market, they aren't the only company to produce e-readers; competitor Kobo feature in our round-up, too. So for a concise round-up of the best Kindles and e-readers, read on to find out more. The Kindle Oasis could certainly send you into an oasis of calm on holiday, because you don’t need to worry about splashing it..or dropping it in the pool. Compared to other Kindles, it’s got way more storage potential, an adaptive light sensor if you’re switching between sun time and shade time, it also boasts the largest screen out of all the Kindles and the highest resolution display, so words appear almost as if they would on paper. Perhaps the biggest advantage is Audible, which allows you to listen to audiobooks, so long as you have Bluetooth headphones - great if there’s an annoying child that won’t stop wailing by the poolside. This Kindle is a little more basic compared to the Oasis; it’s not waterproof and it doesn’t offer audiobook technology, and that’s reflected in the price. However, what it does offer in terms of reading experience is pretty good. Thanks to its hi-res 300 ppi display, it should almost be as though you’re reading off paper, and there’s still plenty of formatting options so you can set your preferred display. There’s also handy extras that allow you to get more from the book, including ways to look up phrases and forgotten passages - great if you’re a sporadic reader. Read a full review here. If you can’t help checking in with your friends on Facebook or you fancy checking out some reviews on your next read, Amazon have come up with a solution in the form of their Fire Tablet. You still have access to Amazon’s library of books and you can adjust the screen according to your reading environment. You can also stream films, catch up on missed episodes and listen to your favourite tracks from Prime or Spotify. Because it’s not solely an e-reader, the reading experience won’t be as refined, and because it’s a budget tablet, people still find it’s processing power to be a little clunky. However, for the price and its capabilities, you can’t complain. Just because Amazon are the giants of the e-reader world, doesn’t mean others from other brands aren’t just as good. Actually, they can be less bias than Kindles, like this Kobo Aura, which is compatible with a wide range of ebook formats- great if you’re a fan of borrowing ebooks from your local library. It’s also waterproof, like the Kindle, and has a 7.8” screen so it can display a substantial amount of words. Thanks to its Carta E Ink touchscreen, it promises a print-quality reading experience however, if you’re looking for an e-reader for web browsing, reviewers find the internet browsing experience very poor, which seems to be a general problem with e-ink devices. If you’re not dedicated to investing in the very latest in e-reader technology, then this basic Kindle will fair you well. Function-wise, it’s pretty similar to the Paperwhite - you can download books from the Amazon library via wifi and delve further into the book, thanks to its research tools. You’ll probably notice a difference with the reading experience, because the screen resolution isn’t quite so high but on the upside, it’s much lighter than the other two Kindles - great for one-handed reading. If all you’re looking to do is read, this one is the ideal purchase and at an RRP of £60, it won’t matter too much if it gets battered around in your bag. Go wireless with our round up of the best portable speakers.